Thank you. It was a pleasure meeting with you last week. Thank you for going through the forensics with us. The jury deliberated for 3 1/2 hours yesterday before acquitting our client of the charge of First Degree Murder. Thanks for reviewing the evidence in the case and for all the analysis work you did in our case. We really appreciate it, an﻿d we will ce﻿rt﻿ainly rec﻿ommend you to other lawyers within the office. It was a pleasure to work with you. Thanks again." "I knew JD when he was an investigator in Virginia. He was completely professional and thorough and it was a significant loss when he left Virginia. I am proud to know him and be able to continue to count on his expertise and advice." "I have known Mr Thomas for many years, back when he was an investigator in Virginia. His pure professionalism and knowledge in his field of expertise is second to none and I would not want anyone else to handle my case!" "I have been practicing law for 32 years. In my experience, I would place Mr. Thomas at the top in the skill level analysis. He is prompt and efficient in his job. As a result of his experience and training, J.D. is sought for consultation throughout the Circuits in Florida in the field of forensics. We discuss all of my cases before and during trial and he frequently comes up with angles or ideas that I had not considered. "The training and experience of Mr. Thomas as a seasoned and skilled law enforcement officer has often proved invaluable in uncovering investigation errors committed by law enforcement. These efforts often end in the client's obtaining a satisfactory result." "Criminal Defense Investigator J.D. Thomas obtained a search warrant in a DUI manslaughter case to show that another car, a white Bronco, had pushed the client's yellow car into another vehicle in which a person was killed. The white Bronco in question revealed yellow paint. The search warrant resulted from extensive investigation by Investigator Thomas in locating witnesses and eventually, the concealed Bronco". "My first case with Mr. Thomas was a first degree murder case. Mr. Thomas was able to gain access to the crime scene and it was his analysis of that scene that aided me in understanding the events that led to the victim's death. During that very complicated and difficult case, Mr. Thomas was materially involved with all aspects of the defense case. I could not have achieved the positive result that we got in that case had I not had Mr. Thomas involved. Since Mr. Thomas is a former law enforcement officer, he is able to strategize and offer insight about why a case was prosecuted or investigated a certain way. I consider him to be an example of what all criminal investigators should aspire to be. "I can't say thank you enough to JD Thomas. In the week before trial, we recognized a blood spatter issue. We called JD and got him the photos and within a day had his expert opinion that the 'victim's' many versions of events were all completely contradicted by the physical evidence. JD was qualified as an expert in blood spatter and gave awesome testimony. Jury returned with a Not Guilty verdict". "Big thanks to J.D. Thomas for going above and beyond as always." "JD- I cannot thank you enough! It was such a pleasure to work with you. Your dedication and insight was invaluable! I truly would not have been able to make sense of this crazy case without your re-decorating, stringing and early morning epiphanies! YOU ROCK!" 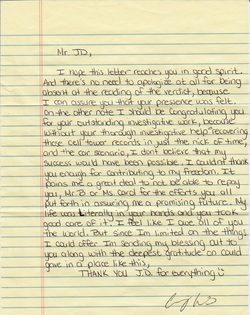 "JD Thomas worked our case for well over 2 years. He not only worked the case, he lived it day and night. He traveled to North Carolina to make sure he worked every angle. He made sure he did not miss anything. Our family truly appreciates every minute of everyday that he helped our family member. I myself have worked with JD Thomas and I know that he is an extremely hard worker. He takes every case he handles like it was his own family member. His cases are not only work, they are who he is and what he is about. Thank you JD for everything you do. Keep up the good work." "I got this case and knew what I was wanting and searching to find in the evidence. But I can tell you definitively I would not have been able to bring it to life or make sense of it without you! Thank you thank you thank you!! You were amazing on the witness stand!! You truly went above and beyond! Forever grateful!" "J.D., I want to thank you for your participation as a member of the panel in Saturday's Town Hall Round Table discussion on Caylee's Law and the Casey Anthony trial. Your willingness to be a member of the panel in the face of very low community approval of the verdict was above and beyond the call. As it turned out, everyone involved liked the 2 hour brainstorming session it turned out to be. We had very high level panel members and a very high quality discussion. I have to say your contributions on the subject of Caylee's Law certainly moved my perspective forward on the issues involved." "J.D. is very detailed, extremely focused and ethical, a consummate professional. If you need a strong forensic consultant or an investigator, I would not hesitate to recommend him. He is not, and never will be, a hired gun; he will investigate the matter carefully, analyze the evidence and provide you with an honest, detailed and﻿﻿ accurate﻿﻿ opinion. His integrity is second to none. If you need an expert in his field, J.D. will exceed your expectations." J.D. has a remarkable forensic﻿﻿s background an﻿﻿d handles himself well in court and in the field. I would not hesitate to recommend him and would want him on my side in any court situation. J.D. - You are a﻿﻿ natural at what you do and so proud to be your friend. Keep up the good work and pass along all your good deeds to everyone ! "I had the pleasure of sitting down with J.D. today and explore the world of forensic science. As a student studying forensic science, it was an outstanding opportunity to get real life testimony to the field of forensics. I took the opportunity to soak in the knowledge that J.D. brings to the field of forensics and will be able to apply that to what I am studying at Saint Leo University. I want to say thank for taking the time to sit with me this afternoon!" A letter from a young man who was facing the possibility of spending the rest of his life in prison. I chose J.D. Thomas to review the case file of a deceased family member and I was extremely impressed at his attention to detail and how thorough and knowledgeable he was. He always kept our lines of communication open and answered any questions I had. He went above and beyond to help me get answers in the death of my family member and I think he is a tremendous asset to anyone wanting a fair, honest, professional, and thorough investigation from an independent analyst. He was a pleasure to work with. I loved having the questions you prepared to help us for trial. They will be of use to me going forward. I really enjoyed working with you in this case and would love an opportunity to meet in person some day.